The NASCAR Weekly Racing Series presented by Dodge was back in action on Lou Ann Lathrop Iowa Realty night at the races at the West Liberty Raceway on Saturday night. 27 NASCAR Late Models took the green flag for their 25 lap feature. Ray Guss Jr. started in the fourth row but quickly shot to the front securing the lead on the 5th lap. Guss went on to lead the remaining 20 laps in scoring the win. Denny Eckrich worked to the front from his sixth row start but was unable to catch Guss, as the laps wound down, Bobby Sexton, who has been one of the strongest cars as of late closed in on Eckrich and took the second spot, Sexton ran out of laps and settled for second to Guss Jr. Eckrich took third ahead of the two Hylan Phillips owned cars, Fred Remley took fourth ahead of Andy Nezworski. It is always nice to see a first time winner make an appearance in victory lane that happened in the Miller Time Modifieds on Saturday night. Steve Kohli scored a hard fought win over Larry Herring. Kohli scored the win on his wife�s birthday and the night was sponsored by his co worker Lou Ann Lathrop of Iowa Realty. Kohli has been racing for several years making the hard fought win that much sweeter. Kohli led the 20 lap feature flag to flag and was able to hold off all challengers even though the field was bunched up on several occasions. Scott Megonigle ran third ahead of Rick Hixson. The DADCO Corp/Parker Stores 15 lap Pro Stock feature win went to Bruce Miller on Saturday night. Miller ran up front the entire feature scoring his second win of the 2002 season at his home track. Andy Eckrich took was able to advance from his sixth row start but was unable to catch Miller. The Pro Stock feature was red flagged for a grinding 8 car accident before one lap was able to be completed. 6 of the 8 cars involved were unable to return to the track, but fortunately no one was injured in the accident. The race went flag to flag following the lap one restart. Gary Beuter took third at the checkers ahead of Jason Gingerich. Defending NASCAR Hobby Stock track champion Jeremie Thompson earned a hard fought feature win on Saturday night. Thompson worked to the front a fifth row start taking the lead after the midway point of the race. Thompson finished ahead of Davey Elliott with Stan O�Brien taking third. 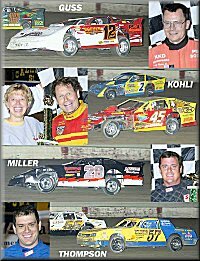 The NASCAR Weekly Racing Series will be back in action at the West Liberty Raceway on Wednesday, July 17th as we open the 2002 Muscatine County Fair. A full NASCAR points show will be run with race time set for 7 p.m.